Nordor is a band that has some history in my country's metalscene. Its members play in other famous Greek bands like Naer Mataron, Horrified and Goatvomit. They exist from 1989 and they have yet to produce a full-length. When they release something though it's something great. Nordor isn't (wasn't and won't be) an average band. They have something that keeps them going all these years that many bands lack Personality. sudah terlalu banyak gw menulis rilisan2 dari band2 benua eropa, semoga gw ga tambah dipusingkan dengan beberapa genre yang dimainkannya, karena pada dasarnya gw cuman ingin berbagi Informasi aja dengan para pembaca setia Lost In Chaos, agar selalu tidak terpancang dengan satu atau dua nama band yang selama ini kalian kenal, karena ada banyak sekali band2 bagus dan keren diluar sana yang belum terekploitasi dengan baik. kembali scene Greece menjadi bidikan gw selanjutnya. dari daerah Athens, Attica, memang menjadi salah satu daerah yang memiliki band2 bagus yang harus kalian kenal banget eksistensinya. NORDOR adalah dari sekian nama tersebut, mengusung gaya Extreme Death Metal dan menghalalkan beberapa sentuhan Blastbeat adalah konsekuensi awal sejak Nama Nordor terbentuk tahun 1989, band ini telah mengalami bongkar pasang formasi yang saat ini cuman menyisakan frontman gitaris dengan nickname sebagai False Prophet tetap kuat berdiri dibalik nama Band ini sebagai salah satu Obsesi hidupnya. dengan karakteristik musik style ala Obituary, Septic Flesh, Bolt Thrower hingga Celtic Frost telah menjadi dasar beberapa penciptaan materi. beberapa materi telah dirilis, namun sayang nama band ini kurang terasa populer discene Internasional. dan " Erga Omnes " adalah materi Full album ke-2nya setelah " Honoris Causa " tahun 2008. dialbum baru ini Nordor ingin lebih menciptakan karakter kualitas sound yang lebih baik dengan melibatkan 3 enjiner, Christos Antoniou adalah Gitaris band Septic Flesh dan Chaostar, dibantu oleh Fotis Benardo, drummer band Chaostar, Septic Flesh, Necromantia, Double Square dan pernah memperkuat Nightrage pula, kemudian juga George Emmanuel, Gitaris band Rotting Christ dan Valet Parn juga pernah menjadi Bagian dari Chaostar. sementara untuk proses mixingnya digarap oleh Henrik Udd yang juga pernah menggarap albumnya Septic Flesh, Old Man's Child, Tracedawn, Spiritual Beggars, Outrage, Norther dan masih banyak lagi rupanya telah cukup memperoleh poin plus dasyatnya materi Nordor kali ini. dan masih dikerjakan dengan orang2 disekeliling band legendaris macam Septic Flesh, Chaostar dan Rotting Christ rupanya telah membawa Pengaruh tersendiri pada konsep matang kali ini. swedish sound ala Dismember dan Entombed awal adalah elemen paling kental terhadap struktur sounding Nordor. They retain their satanic and iconoclastic imagery while still being rooted into death metal with obvious technical leanings. The song structures are chaotic. lagu pertama " Memories from the Future " setelah dilalui intro sebelumnya, cukup menawarkan gaya death metal agresif dengan sound modern yang fantastis. sehingga amat terasakan Kemajuan pesat musikalitas Nordor dibanding materi sebelumya. sentuhan Riffing Gitaris False Prophet mulai lebih menampilkan elemen Thrash metal Modern yang begitu padat. dan raungan vokalis Lordwinter didebutan ke-2 juga kian enerjik saja. The guitars on this album are very technical. The drumming is tight and fits the album. Most of the times the pace is fast with some breakdowns (especially in solos). The vocals are low-pitched growls. Lord Winter is a very skilled vocalist. you can hear some amazingly agonizing shrieks made by False Prophet every Track inside. sentuhan karakter modern padat terasaka hampir disetiap gebrakannya. selanjutnya " Misanthropic Caleidoscope ", Drummer Lithras mulai menampilkan pukulan Fast Snare beat-nya, dan beberapa sentuhan Avant Garde Black metal gelap sangat terasakan disini. lumayan sih sedikit mengingatkan dengan karakter awal Krisiun pula pada tempo cepatnya. Suprise juga dengan Track " Thelisis ", karena gw bisa menikmati pola bermain liar dan Brutalnya Nordor banget sepertinya telah banyak memberi inspirasi dan feel kuat untuk Nordor semakin tampil cepat dan keras dimateri kali ini yang tersaji dalam 12 lagu berdurasi maksimum total sekitar 40:32. sajian Extreme Death Metal dengan beberapa sentuhan Avant Garde Black metal menjadi sebuah perjalanan babak baru mungkin bagi band ini lebih open minded pada segala perubahan. If you can find this get it at any cost. If you enjoy death metal you will surely like this. jangan lupa Artwork kover keren karya Frontman Septic Flesh, Spiros Antoniou turut menghias rilisan ini menjadi masterpiece berbahaya Nordor ditahun 2012. komposisi Satanic death metal bagus bisa kalian dapatkan disini. Nordor is a band that has some history in my country's metalscene. Its members play in other bands like Nær famous Greek Mataron, Horrified and Goatvomit. They exist from 1989 and they have yet to produce a full-length. When they release something though it's something great. Nordor is not (was not and will not be) an average band. They have something that keeps them going all these years that many bands lack Personality. i write too much rilisan2 of band2 continental Europe, may gw ga plus mess around with some of the genre they play, because basically gw aja cuman want to share information with our loyal readers Lost In Chaos, that always stuck with one or two band names for this you know, because there are a lot of nice and cool band2 out there that has not been properly exploitative. Greece into shooting scene again next gw. from the Athens, Attica, has become one of the areas that have good band2 what you should know very existence. NORDOR is of the name, brings style Extreme Death Metal and justifies some touch Blastbeat is the initial consequence since Nordor name formed in 1989, the band has undergone disassembly formation currently cuman leaving frontman guitarist with a nickname as the False Prophet remained strong standing behind The band's name as one of his life's obsession. with characteristic style music ala Obituary, Septic Flesh, Bolt Thrower to Celtic Frost has been the basis of some of the material creation. some of the material has been released, but unfortunately the name of the band seem less popular discene International. and "Erga omnes" is a matter 2nya Full album after the "Honoris Causa" in 2008. 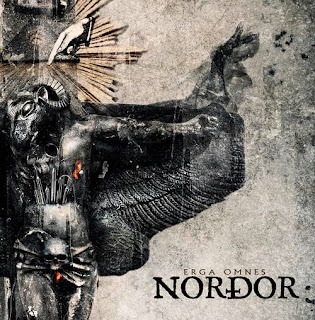 This new dialbum Nordor want more create a character that better sound quality by involving three engineers, Christos Antoniou is guitarist band Septic Flesh and Chaostar, assisted by Fotis Benardo, drummer Chaostar, Septic Flesh, Necromantia, Double Square and played for Nightrage anyway, then also George Emmanuel, guitarist band Rotting Christ and Valet Parn also been a part of Chaostar. while the process worked by Henrik UDD mixingnya who also worked on the album Septic Flesh, Old Man's Child, Tracedawn, Spiritual Beggars, Outrage, Norther and many more seem to have gained enough points plus dasyatnya Nordor material this time. and still worked with legendary band surrounding orang2 kinds Septic Flesh, Rotting Christ Chaostar and seems to have brought its own influence on the concept of time is ripe. swedish sound ala early Dismember and Entombed are the most viscous element of the structure Nordor sounding. They retain their satanic and iconoclastic imagery while still being rooted into technical death metal with obvious leanings. The song structures are chaotic. The first song "Memories from the Future" after the intro traversed before, just offering aggressive death metal style with modern sound fantastic. so it felt very rapid progress musically Nordor than previous material. Guitarist riffing touch False Prophet began more display elements Modern Thrash metal is so dense. and the roar of the vocalist Lordwinter didebutan-2 also increasingly energetic course. The guitars on this album are very technical. The drumming is tight and fits the album. Most of the times the pace is fast with some breakdowns (especially in solos). The vocals are low-pitched growls. Lord Winter is a very skilled vocalist. you can hear some amazingly agonizing shrieks made by False Prophet every track inside. modern character touches almost every solid terasaka gebrakannya. hereinafter "Misanthropic Caleidoscope", Drummer Lithras started showing stroke Fast Snare beat her, and a few touches Avant Garde Black metal really felt dark here. pretty little reminiscent of the character's early Krisiun also in rapid tempo. Suprise also the Track "Thelisis", because I can enjoy the play patterns of wild and brutal Nordor really seem to have much to inspire and feel strong enough to perform faster and more Nordor dimateri hard this time presented in 12 tracks total maximum duration about 40:32. dish Extreme Death Metal with some Black Metal touches Avant Garde into a new round trip possible for this band more open minded to any changes. If you can find this get it at any cost. If you enjoy death metal you will surely like this. do not forget to cool Artwork cover works Frontman Septic Flesh, Spiros Antoniou helped decorate this release dangerous Nordor masterpiece in 2012. Nice composition of Satanic death metal can you get here.